Washington DC — A group of 93 Sudanese scholars, human rights organisations, and leading activists have published an open letter strongly urging the US Government to support the participants in the current Sudan uprising, by calling for President Omar Al Bashir to step down and by supporting democratic transformation in Sudan. In the open letter addressed to the President of the USA, heads of the Senate Committee on Foreign Relations, and of the House Committee on Foreign Affairs, the group under the umbrella of Act for Sudan, urges the US government "to support their [the opposition's] aspirations, as well as greater regional stability". The group points out: "Despite the right to peacefully assemble, a guarantee of Sudan's Interim National Constitution, peaceful protesters have been fired upon by the Sudan regime and reports indicate that over 40 have been killed, well over 300 have been wounded, and more than 800 have been arrested. The news from Sudan is replete with reports of government forces deliberately shooting to kill peaceful demonstrators and other shocking violations of basic humanity. In spite of these terrifying circumstances, protests are growing and courageous Sudanese across all regions of Sudan are calling for an end to the Al Bashir regime." The letter suggests: "Any consideration of normalising relations with the Sudan regime sends the wrong message, not only to the regime in Sudan, but also to bad actors worldwide, putting the United States and its allies at additional risk. 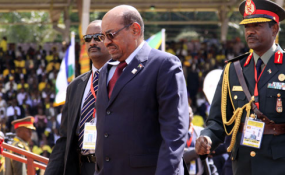 US policy must pivot to advance freedom, justice and democracy in Sudan. Please support the people of Sudan and their call for an end to Bashir's genocidal regime."